I probably finished this in August. I am just now getting around to get pictures of it. Every time there was nice weather for pictures, I either forgot to bring the skirt or my camera out to my parents’ house. Finally, I broke down and decided just to just the timer on the camera so I can get the pictures done. So you got pictures with the bunny so I didn’t fall over him while doing pictures. This is the Veronika skirt from Megan Nielsen patterns. It is available for free! It is a circle skirt with waistband, fabric and pocket options. 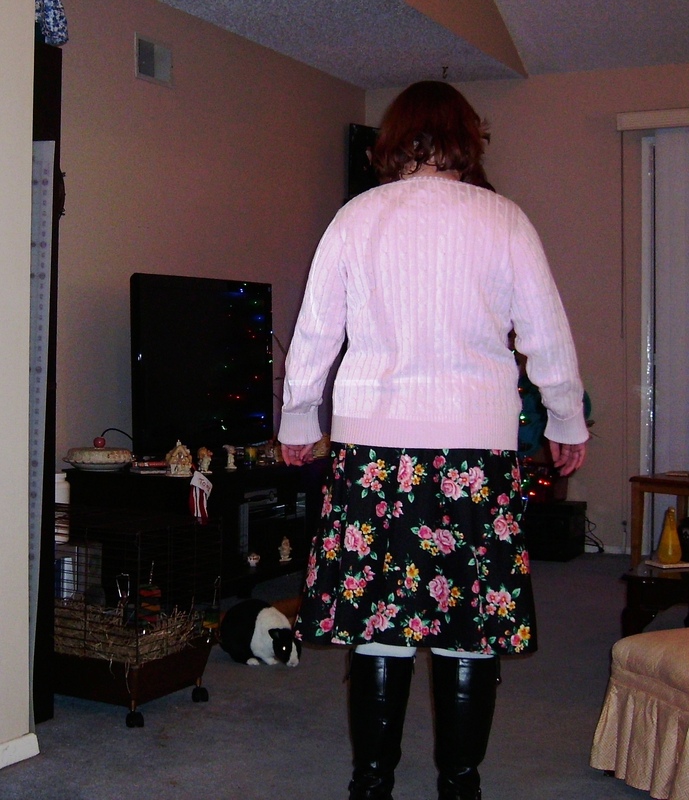 I used the left over scuba knit from my Lindy petal skirt to make view C of the skirt. The scuba knit was very easy to sew with. Since the scuba knit has some body to it, the skirt sort of ripple folds and flairs away without any sort of petticoat to hold it out. I didn’t do any pattern alterations. I used a size XL. Instead of the normal 5/8 inch seam allowance, I used a smaller one so I would have a 35″ waist for my skirt. I think the skirt is a little long for me; maybe around an inch or two. I feel a little short when I wear it and look in the mirror. If I was to make this again, I would definitely be shorting it. I would like it to fall at my knee. This would definitely be a skirt pattern to consider using again. 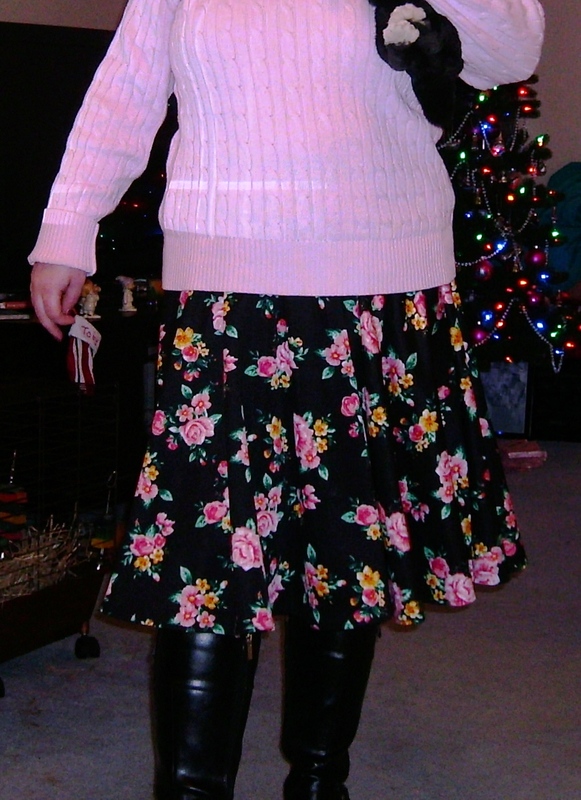 I am at the top of the size range with using a knit skirt. So any future knit skirts, I would be taking the extra length off the bottom. But considering that I would have to alter the pattern to get it to fit for woven, it may be more beneficial to take the extra length off in the waist of the skirt to get the wider waist and just add the length needed on the waistband. So the failed Closet Case Files Ginger jeans really have taken a toll on my sewing confidence. Since the failure, I have only made 2 items, the McCall’s 7094 blouse and the True Bias Sutton blouse (still needing pictures). I am still planning on making a skirt for my mom for Christmas. After that, I think I may switch up to doll clothes and a couple of Pinterest tutorials for boot cuffs while I decide what pattern to do next. I am definitely not ready to tackle the jeans again. The Irish Sea set of boot cuffs is from Leisure Arts #75472, Boot Cuffs & Ear Warmers. I picked up the book in August and it probably wasn’t until September when I bought yarn for a project. I picked up Lion brand wool ease in Blush Heather. I really didn’t think about being able to wear with what I own/ make; I just picked a color I thought was pretty. But at least this goes with several items in my wardrobe. Irish Sea is only my third different crochet project. The finished cuffs are actually the second and the third cuffs made. Cuff number one was a practice cuff. The ribbing in front/ back fence post half double crochet did require practice to get it down. Otherwise, the pattern instructions are easy to follow. As previously stated, since this was my third crochet project, I didn’t end up with identical cuffs. Cuff two has extra front fence post stitches in the back (it looks like I miss counted on stitches). Cuff three matched the book exactly. 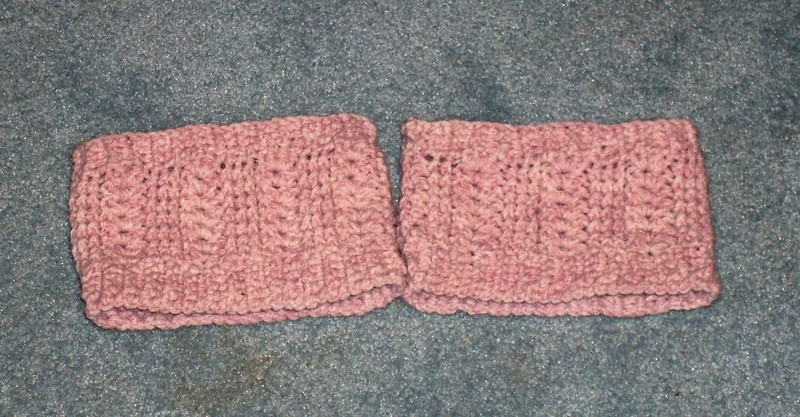 Stitches used in the cuff are the front/ back fence post for half-double crochet and double crochet, regular half-double crochet, and regular double crochet (for the shells). I used a H-sized crochet hook. I wasn’t able to take my own picture wearing these, but they fit fine.